Trullo located in Marina di Mancaversa, the distance from the nearest beach access point is 2,5 Km. 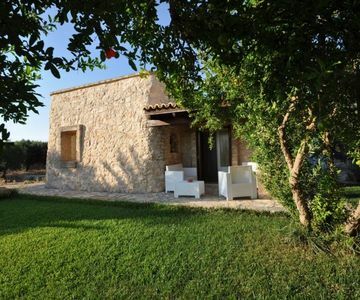 The trullo can accommodate up to 4 people, and consists of 2 bedroom(s) and 1 bathroom(s): bedroom: 1 double, bedroom: 1 full, living room: 1 sofa bed-single, bathroom: 1 full, It is located on the ground floor ground floor and covers a total of about 1565 meters square. There is a comfortably furnished garden that is partially fenced. The house has: kitchen,freezer,refridgerator,children's playground,washing machine,linens,garden furniture,outdoor shower,tv,quiet area. Guests may park in the on site (fenced in). The nearest restaurants, shops and services- more than 1.5 km, services public transit-more than 1.5 km. The price refers to the cost of the rental and includes utilities. Additional services can be added during the rental period as they are available: - Final cleaning fee included in price - Linens (sheets and towels): €20 per person - Pet deposit: €50 Instructions for the check-in: check-in begins at h.17:00 and check-out must be not later than h.10:00. During the high-seasoncheck-out check out must be on a Saturday (June-September) and requests must be for a minimum of 7. - Pet policy: small sized The seaside of Mancaversa is rocky with intermittent, little cove like sandy landings where people can easily enter the water or set up their umbrellas. The shallow water makes it easy for everyone to swim, including small children. About 1-2 km away there is the natural reserve Punto Pizzo with its Lido, or beach club, that marks the beginning of the stretch of beaches in Gallipoli known as Baia Verde. Here visitors have to the option to rent sun beds, umbrellas and purchases drinks and snacks from the concession stand. Alternatively, a 10 minute drive south will bring you to the beach of Torre San Giovanni in Ugento. Here beach goers have about 12km of sandy beach to spread out on.